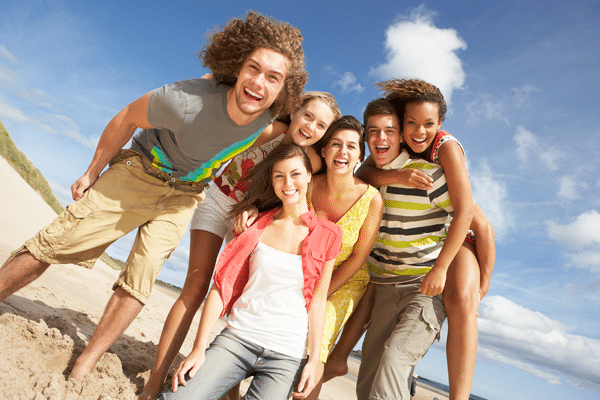 For teens, the idea of undergoing orthodontic treatment may be a stressful prospect. No one wants to look at photos of their teenage-era summer vacation, cousin’s graduation party, or everyday Instagram candids and feel self-conscious about their smiles. Fortunately, traditional metal braces are no longer the only option for teenage orthodontic treatment. Dr. Glaser and the team at Glaser Orthodontics have experience treating their patients with Invisalign Teen in Jefferson Valley, NY. Glaser Orthodontics offers their patients treatment with Invisalign Teen, a custom solution just for teens that is more comfortable and less obvious than traditional braces and is equally effective in most cases. Invisalign Teen is a series of clear, plastic aligner trays that are custom made to fit over the teeth. They work in the same way as traditional braces do to gently move teeth to their optimal positions within the mouth and deliver a straight and healthy smile. Patients near Jefferson Valley, NY may believe that they are not eligible for treatment with Invisalign because they have a complicated or unique case. Dr. Barry Glaser treats patients with a range of orthodontic treatment needs with Invisalign. Invisalign Teen is removable. It gives the wearer the freedom to eat the foods they love without having to be concerned about damage to their teeth or dental work. Invisalign is removable by the wearer to eat, brush, floss, and clean the aligner tray, so care and maintenance is easy. Invisalign Teen allows the wearer the freedom to participate in sports or play a musical instrument because Invisalign is removable. Because Invisalign is removable, it can be forgotten or misplaced. Dr. Barry Glaser reminds his patients to be conscientious about keeping the Invisalign tray safe and secure while it is not being worn. Invisalign Teen is completely clear. Invisalign Teen gives patients near Jefferson Valley, NY the opportunity to feel fully confident in their smiles while undergoing treatment. Only the patient wearing the Invisalign aligners can tell they’re there, making for a more cosmetically pleasing system than traditional metal braces. Treatment with Invisalign, like any other orthodontic treatment system, requires the patient to wear a retainer to ensure long-lasting results after treatment. It’s true. No matter what you’ve believed in the past, a confident, radiant smile can be within reach. And if you think about it, improving your smile is an important investment, because you’re doing it for yourself. Dr. Barry Glaser of Glaser Orthodontics will make sure you can have one of the best smiles in Westchester County. Invisalign Costs: How Much Does Invisalign Really Cost? There are many factors that determine the your Invisalign costs and treatment: how extensive the issues you want corrected are, how long your treatment plan will last, and the specific treatment details prescribed by Dr. Glaser in his Cortlandt Manor office. We strive to make Invisalign affordable to everyone. You can get a beautiful, healthy and straight smile for as low as your monthly cell phone bill. Dr. Barry Glaser and the team at Glaser Orthodontics are the experts in Invisalign, Invisalign Teen, braces and clear braces. He provides these orthodontic services to residents of Cortlandt Manor NY, Westchester County NY, and Putnam County NY. If you have any questions or or would like to schedule a complimentary consultation with Dr. Barry Glaser, contact Glaser Orthodontics at: 914-739-6400.